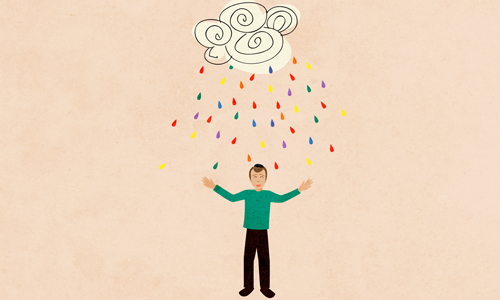 If it rains during Sukkot, we don't have to sit in the sukkah, correct? So why have I seen people who continue to sit in the sukkah even when it is pouring? Sitting in the sukkah is the only mitzvah that, if you're bothered by it, you're exempt. Usually, even when a mitzvah is hard, you have to do it. Like fasting on Yom Kippur, when only those who must eat for medical purposes may do so. Most people find not eating or drinking for 25 hours quite uncomfortable, but we still have to do it. And yet, if sitting in the sukkah bothers you, like in wet weather, you can leave and eat inside the house. Nevertheless, many people refuse to eat outside of the sukkah, no matter how bad the weather, because they would be more bothered by eating inside a dry home than outside in a leaking sukkah. When you understand what the sukkah is, you'll see why. The sukkah is a holy space. You are sitting in a divine abode, under the heavens, with the stars shining down on you, surrounded by angels and the souls of our forefathers. Our sages teach that we are only worthy enough to enter the sukkah after Yom Kippur, when our souls have been cleansed and we are at our spiritual peak. And the mystics explain that while the sukkah may look like a derelict hut cobbled together from wood and branches, in truth it is a made from the holy names of G‑d. The weather may be a little unpleasant, it may be a little squashy in there, and your palm allergy may be flaring up...but the inner serenity, the love and feeling of connection with those around you, the sense of being embraced by G‑d—all that should override any physical discomfort. If you're still not enjoying the sukkah, then you're not really in the sukkah in the first place, and you can go inside. But if you know what your missing, you won't want to leave. Why Is Sukkot Celebrated in the Autumn? If our souls supposedly get cleansed on Yom Kippur, I wonder why our personality defects still remain and we keep indulging in the same old bad thoughts, bad habits and bad actions often with renewed vigour after an attempt to be artificially restrained on Yom Kippur. So how do we understand the Mishna that when one eats in the Sukkah when it's raining it's compared to a servant the offers a drink to his master, but his master pours it back in his face. The Mishnah Berurah says that one who sits in the Sukkah during a rain is a hedyot (fool) and either the Chofetz Chaim (or possibly other commentaries) state that the rain is a message from Hashem to get out of HIS sukkah due to something that the community did not do correctly. Actually the Mishna says that when one eats in the Sukkah when it's raining it's compared to a servant the offers a drink to his master, but he pours it in his face. The Gemmara then expounds by asking "[w]ho is he?," and concludes that "he" is the master pouring water in the servant's face and not the other way around.